One of Denver’s only soccer-centric bars has closed and will rebrand itself to attract fans of other sports, according to its owner. Three Lions Pub, which opened at 2239 E. Colfax Ave. in 2011, closed for good this week. Little Pub Co. owns more than 20 bars in the Denver area, according to its website. Little Pub Company took over the site at 2239 E. Colfax Ave. from The Bank Bar & Grille in 2011. The company remodeled the building and decorated the interior to resemble typical London pubs, according to the venue’s website. The pub used the British term for soccer, labeling itself Three Lions, A World Football Pub. Its website shows early-morning weekend hours intended to allow customers to watch European soccer matches live. 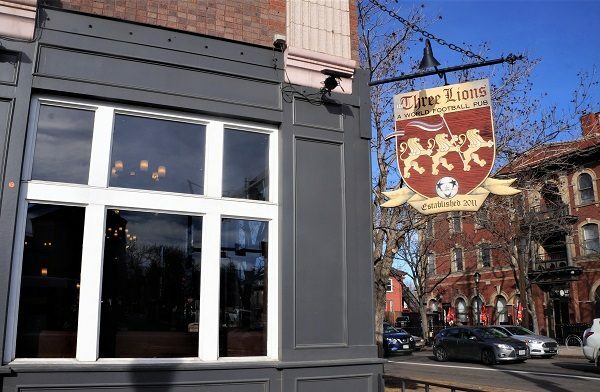 Along with the British Bulldog, another soccer-focused pub owned by Little Pub Co., the Three Lions was a predominant staple in Denver’s soccer culture. The Premier League’s online bar finder, which helps fans locate nearby bars that play the English soccer competition on TV, lists only four bars in Denver — including the Three Lions. The closure leaves only the British Bulldog, Abbey’s Tavern on East Colfax and Esters Neighborhood Pub on South Holly. A 2014 Denver Post article listed three other alternatives for Denver soccer fans: Fado’s Irish Pub, the Armoury and Celtic Tavern, all of which have either closed or rebranded. 1 Comment on "East Colfax soccer pub closes, to rebrand as more traditional sports bar"
Hopefully their re-branding will be up the to the success of their Patrick Carrolls to Paddy the Yank closing/opening on Tennyson Street.